Tasha Polizzi takes chambray to the next level with the Settler Shirt. 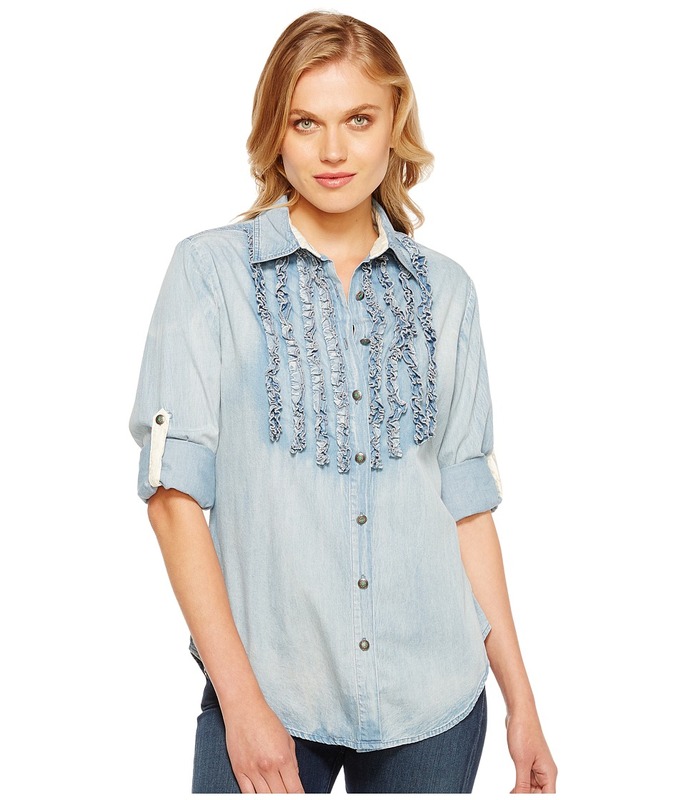 Cotton button-up shirt in a woven, distressed denim. Native-inspired hardware throughout. Pintuck-style ruffles set off this classic shirt. Fold-over collar with printed inner. Printed button-tabs accent the convertible three-quarter roll-up sleeves. Shirttail hem. 100 percent cotton. Machine wash cold. Imported. Measurements: Length: 28 in Product measurements were taken using size SM. Please note that measurements may vary by size. Keep it simply casual in this super-soft Berkeley Dress. Regular fit dress with an A-line silhouette. Metal concho inspired hardware. Lightweight Tencel fabric in a medium wash adorns allover bandana pattern throughout. Spread collar with contrast inner lining. Full front button-up closure. Sleeveless design. Droptail hem hits mid-thigh. 35 percent cotton, 65 percent Tencel. Machine wash, tumble dry. Imported. Measurements: Length: 37 in Product measurements were taken using size SM (Women~s 4-6). Please note that measurements may vary by size. 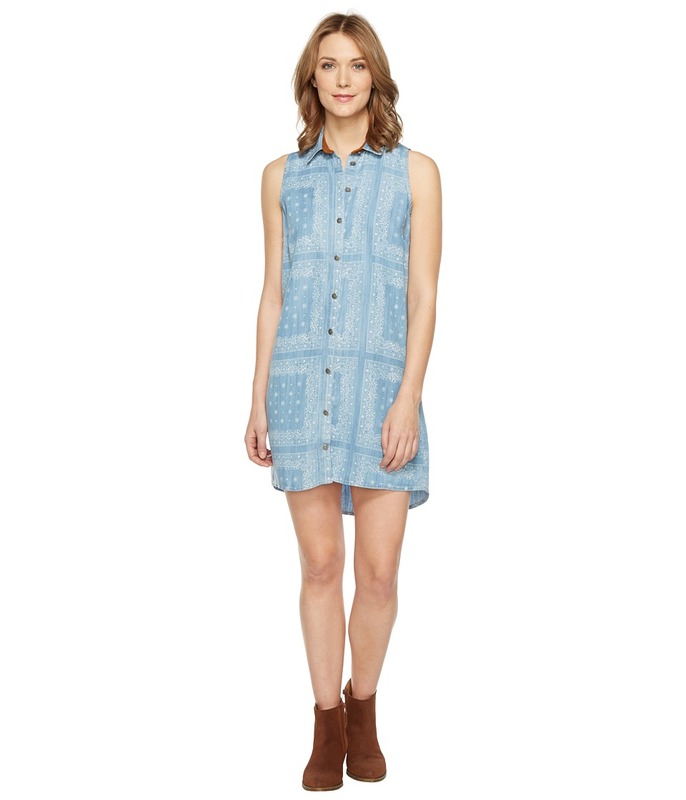 Wake up and feel inspired with this boho-chic Madeline Dress to conquer your day. Relaxed fit drapes the body and offers superior comfort. Lightweight pullover dress adorns intricate pearlized beading along front yoke. Scoop neck. Button closure at nape with keyhole opening. Sleeveless design. Attached full lining. Drop-in hand pockets. Curved hem hits above knee. 100 percent rayon Lining: 100 percent polyester. Machine wash, line dry. Imported. Measurements: Length: 33 in Product measurements were taken using size SM (Women~s 4-6). Please note that measurements may vary by size. Highlight your easy-going lifestyle with this versatile Icon Dress that is sure to steal the show. Regular fit shirt-dress offers an easy, lightly relaxed silhouette. Light-and-airy fabric offers freedom of movement without restricting mobility. Pull-over design. V-neckline. Two-button placket. Sleeveless design. Snap-flap chest pockets. Tonal stitching. Straight hem hits above knee. 97 percent viscose, 3 percent spandex. Machine wash, tumble dry. Imported. Measurements: Length: 35 in Product measurements were taken using size SM (Women~s 4-6). Please note that measurements may vary by size. The weather is getting hot but your outfit is on fire in this fashionable El Fenix Top. 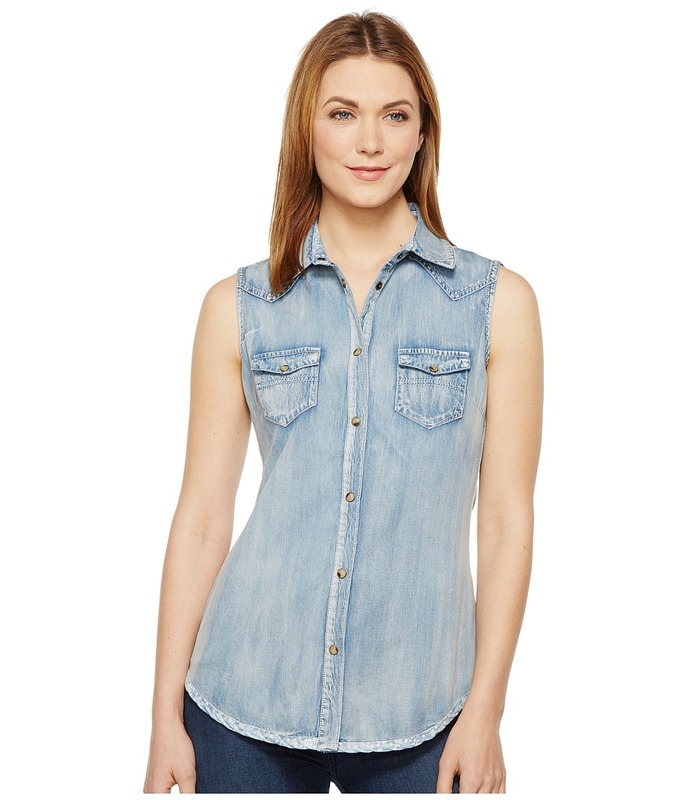 Regular fit tank top offers versatile style as a standalone or layering piece. Lightweight gauze fabric adorns appealing lace panels across shoulders. Notched V-neckline. Sleeveless design. Button-up front closure. Droptail hem with optional self-tie. 100 percent cotton. Machine wash, tumble dry. Imported. Measurements: Length: 33 in Product measurements were taken using size SM (Women~s 4-6). Please note that measurements may vary by size. 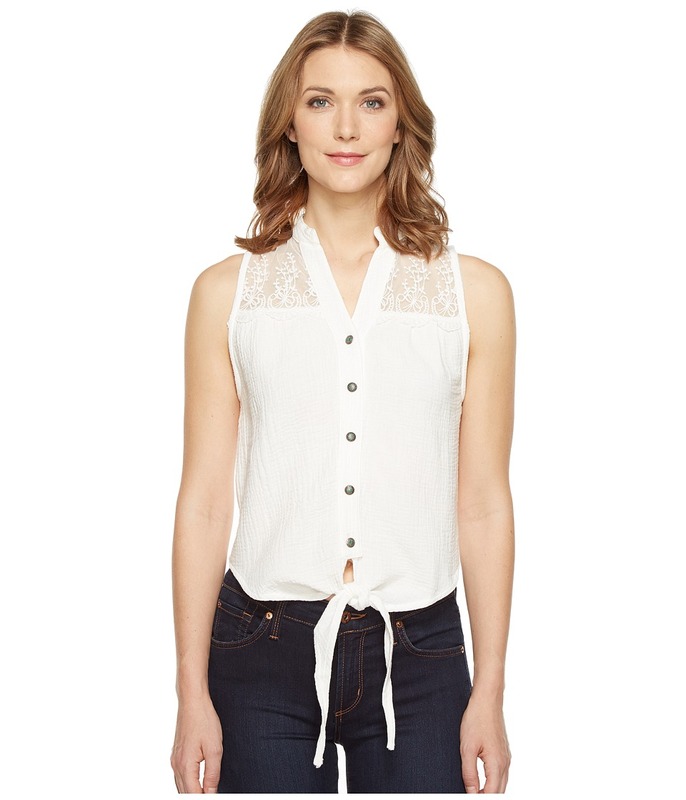 Roll down the windows and cruise into town with exceptional style in this modern Katie Shirt. Relaxed fit hugs the body with tailored darts offering a feminine silhouette. Medium-washed denim offers a vintage-inspired appeal with heavy hand sanding. Spread collar. Front snap-button closure. Sleeveless design. Shirttail hem. 100 percent cotton. Machine wash, tumble dry. Imported. Measurements: Length: 26 in Product measurements were taken using size SM (Women~s 4-6). Please note that measurements may vary by size. Embrace your inner bohemian side with these lively Playa Shorts to brighten up your day. Relaxed fit shorts sits comfortably at the hips and adorns pastel Serape stripes for added style. Lightweight cotton fabrication offers superior breathability and all-day comfort. Stretch waistband with easy pull-on styling. Besom pocket at back right rear. Straight hem with open-knit lace trim. 100 percent cotton. Machine wash, tumble dry. Imported. Measurements: Waist Measurement: 26 in Outseam: 10 1 2 in Inseam: 3 in Front Rise: 8 1 2 in Back Rise: 13 1 2 in Leg Opening: 12 1 2 in Product measurements were taken using size SM. Please note that measurements may vary by size. 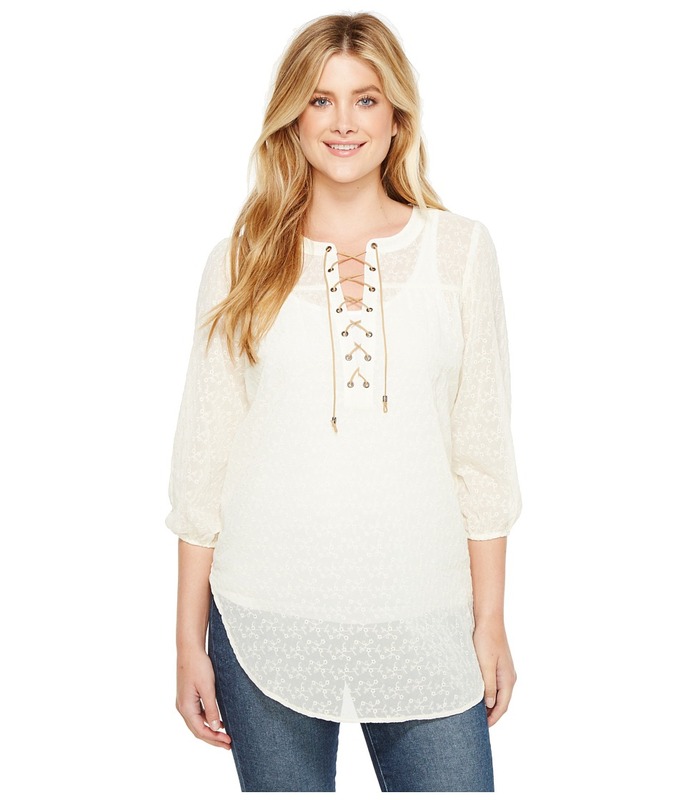 Hum along to the tunes and get your afternoon errands done with this breezy Willamette Top. Relaxed fit in an easy, loose silhouette. Semi-sheer design adorns crochet flowers throughout. Scoop neck with lace-up closure. Three-quarter sleeves with cinch cuffs. Straight front and back yoke. Extended curved hem. Camisole not included. 100 percent polyester. Machine wash, dry flat. Imported. Measurements: Length: 31 in Product measurements were taken using size SM (Women~s 4-6). Please note that measurements may vary by size. 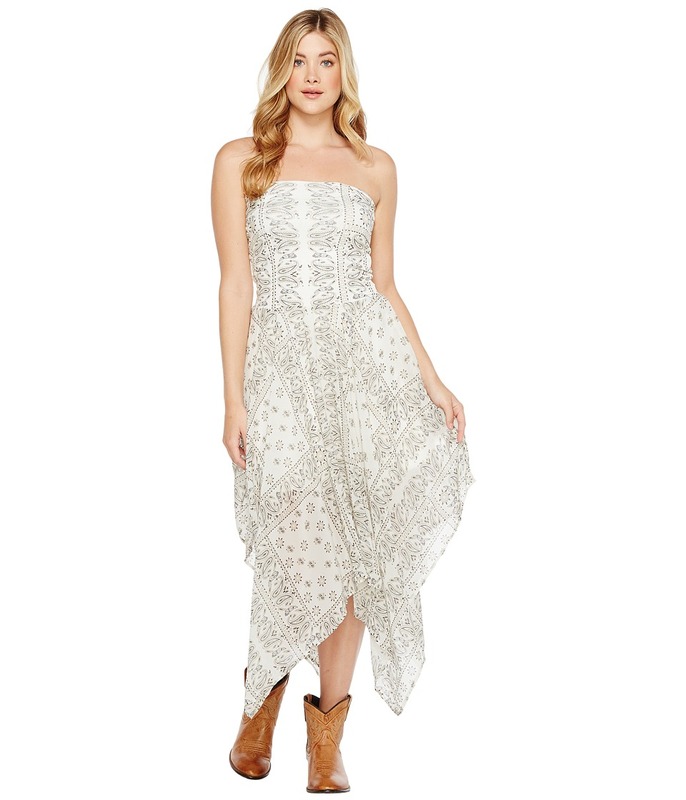 Send out positive vibes and keep you confidence afloat in this stunning Bandeau Dress. Versatile semi-fitted dress can easily be transitioned as a top and paired with your favorite jeans. Light-and-airy fabric displays paisley pattern throughout. Slip-on styling. Strapless design. Cinch waist. Handkerchief hem. 100 percent polyester. Machine wash, tumble dry. Imported. Measurements: Length: 37 in Product measurements were taken using size SM (Women~s 4-6). Please note that measurements may vary by size.